This four-year programme combines the study of Jewish cultural history with the study of the land (and associated languages and cultures) where many Jewish communities had their homes. The third year is spent abroad, in Jerusalem and/or in a relevant central or east European country. A score of 16 points in three higher level subjects including History, with no score lower than 5. A score of 15 points in three higher level subjects including History, with no score lower than 5. D3,M1,M1 in three Cambridge Pre-U Principal Subjects. History required. ABB at Advanced Highers (or AB at Advanced Higher and BBB at Higher). History required at Advanced Higher. 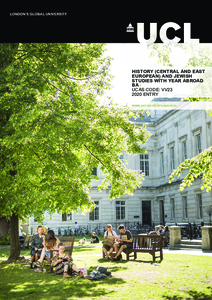 UCL Hebrew & Jewish Studies is the only department of its kind in the UK and is highly regarded worldwide. The programme is taught by acknowledged specialists in the field, all of whom are actively engaged in research. This will enable you to keep up-to-date with the latest debates, issues and discoveries. UCL School of Slavonic & Eastern European Studies (SSEES) is the largest national centre in the UK for the study of central, east and south-east Europe and Russia. The SSEES library contains over 400,000 books, journals and film resources. You will have access to a remarkable collection of Hebrew, Yiddish, and Judaica books in the UCL Library, as well as to the special collections of the British Library, the Wiener Library, and the National Archives. Year one introduces you to the study of central and east European history and Jewish studies at the university level. In years two and four you can focus on topics of specific interest to you by choosing modules that examine particular periods and themes in east European and Jewish history. You can also study one or more relevant languages such as Hebrew, Yiddish, Russian, Polish, or Ukrainian. Your third year is spent abroad, at the Hebrew University in Jerusalem and/or in a relevant central or east European country. All second year modules are optional. You will select 2.0 credits from a wide range of optional modules within the department of Hebrew & Jewish Studies. A further 2.0 credits will be selected from SSEES. Year three involves studying a full-time programme at the Hebrew University in Jerusalem and/or a central or east European university of your choice. You will select 2.0 credits from a wide range of optional modules in Hebrew & Jewish Studies and a further 2.0 credits from SSEES, including the option of taking a final-year dissertation of 10,000 words for the value of 1.0 credit. History modules are taught through lectures and seminars. Modern language study includes oral work, reading comprehension, listening comprehension and translation exercises. Most modules are assessed by an end-of-year written examination, several essays and/or other types of coursework. Language modules are also assessed by oral examinations. Detailed course descriptions are available on the department website: History (Central and East European) and Jewish Studies with Year Abroad BA. Together with subject-specific knowledge, you will acquire discipline-based skills in historical research, methodology and analysis, in addition to transferable skills such as working as part of a team, analysing and solving problems, organising your time and resources, and structuring and communicating your ideas verbally and in writing. Our graduates take up employment in diverse fields including banking and finance, journalism, publishing, the museum sector, and librarianship. Many choose to pursue further study, either continuing within the field or training in law or teaching (primary and secondary). In your application we will be particularly interested in your motivation to study the history of central and eastern Europe, and your interest in broad matters of language, literature and culture. We will also be interested to learn of experiences you may have had relating to east European and Jewish studies, such as courses attended, travel, and wider reading. The selection process is conducted on the basis of your UCAS application and personal statement. If you receive an offer for a place on a programme, you will be invited to visit UCL Hebrew & Jewish Studies and the UCL School of Slavonic & Eastern European Studies as well as tour the campus. UCL Hebrew & Jewish Studies and SSEES both attract students from a diversity of backgrounds, and our degree programmes reflect a range of cultures, ethnicities and religions. Consequently, we do not require you to have any prior knowledge of Hebrew, nor are you expected to have a Jewish background.